What if Austria was located in the Caribbean? Perhaps, it could be a nice tropical island. Well, obviously you wouldn’t plan your ski holiday there. Apart from winter sports and from a more culinary viewpoint, Austria is most famous for its huge variety of delicious pastries. Perhaps one of the simplest and most popular desserts is the so called Kaiserschmarrn: a light and fluffy batter made with separately beaten eggs, which results in something between a soufflé and a pancake. According to the story of this dessert, it was first prepared and served for Emperor Franz Joseph I during the 19th century, who also gave the name to this dish. Now imagine the Austrian Emperor Franz Joseph I and his beloved wife Sissi sitting at the beach under a palm tree somewhere in the Caribbean. Obviously they won’t be eating their Kaiserschmarrn with apple puree, but rather use tropical fruits instead, like coconut, pineapple or passion fruit. Maybe the result would look somehow like this Caribbean Coconut Kaiserschmarrn. 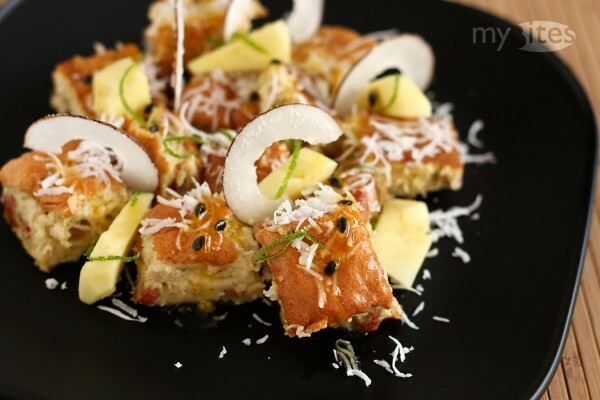 This entry was posted in Dessert, Vegetarian and tagged ananas, austria, caribbean, coconut chips, dessert. coconut, egg, goji, goji berry, kaiserschmarrn, lime, passion fruit, pineapple, rum, tropical fruit, wolfberry on December 1, 2011 by Robert.